Situated in the heart of Paris, in the centre of the business and tourist areas, between the Opera and the Madeleine, a welcoming team will be attentive to all your needs during your stay. A few steps from the Concorde and the Champs-Elysees, the hotel Massena will provide the best Parisian savoir-faire to facilitate your stay in the French capital. The Hotel Massena offers you the comfort of its 36 non-smoking rooms all equipped with a private bathroom with shower or bathtub and WC, hairdryer, air-conditioning, private safe, minibar, television with LCD screen, satellite, and WIFI free access. 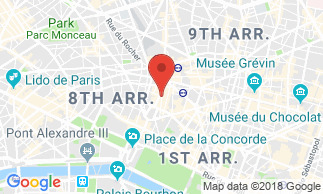 The hotel is located in the centre of Paris, at the crossraods of the business, tourist and leisure activities of the city, between the Opera and the Madeleine districts, nearby the Concorde and the Champs-Elysees. Hotel Massena Excellent team.Unfortunately I had very loudy neighbors one night,they wouldn't stop talking and shouting till 5 am,despite a warning from the reception.Mrs Caroline was very comprehensive and efficient the next day when she knew.I was immediately shifted to another room although the hotel was practically full. Hotel Massena Great, central, location! Room was a little cramped and also too warm - the air con wasn't yet turned on for the season (true elsewhere, I understand). No view - window looked out onto the back of other blocks. Didn't have breakfast, but what I saw looked pleasant. Would stay there again, but probably won't, as we'll sample a different area of Paris, next time.